As water and sewer utilities, the public health and safety of our customers is our priority – it is both a legal and moral responsibility. The economic stability and growth of our community depends on reliable services or high quality. The priority is not the same with private business. Private businesses have a fiduciary responsibility to their stockholders, so cutting services will always be preferred to cutting profits. Therein lies the difference and yet the approach is different. Many corporations retain reserves for stability and investment and to protect profits. Many governments retain inadequate reserves which compromises their ability to be stable and protect the public health and safety. Unlike corporations, for government and utilities, expenses are more difficult to change without impacting services that someone is using or expects to use or endangering public health. Our recent economic backdrop indicates that we cannot assume income will increase so we need to reconsider options in dealing with income (revenue) fluctuations. If there are no reserves, when times are lean or economic disruptions occur (and they do regularly), finding funds to make up the difference is a problem. The credit market for governments is not nearly as “easy” to access as it is for people in part because the exposure is much greater. If they can borrow, the rates may be high, meaning greater costs to repay. Reserves are one option, but reserves are a one-time expense and cannot be repeated indefinitely. So if your reserves are not very large, the subsequent years require either raising taxes/rates or cutting costs. An example of the problem is illustrated in Figure 1. 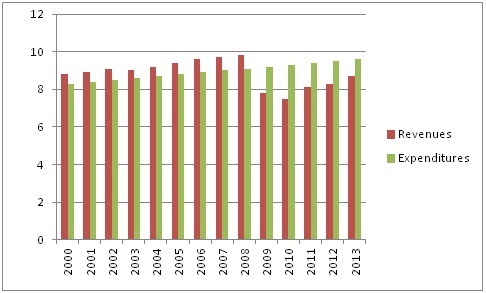 In this example the revenues took a big hit in 2009 as a result of the downturn in the economy. Note it has yet to fully return to prior levels as in many utilities. This system had accumulated $5.2 million in reserves form 2000-2008, but has a $5.5 million deficit there after. Reserves only go so far. Eventually the revenues will need to be raised, but the rate shock is far less if you have prudently planned with reserves. You don’t get elected raising rates, but you have a moral responsibility to do so to insure system stability and protection of the public health. So home much is enough for healthy reserves? That is a far more difficult question. In the past 1.5 months of operating reserves was a minimum, and 3 or more months was more common. However, the 2008-2011 economic times should change the model significantly. Many local governments and utilities saw significant revenue drops. Property tax decreases of 50% were not uncommon. It might take 5 to 10 years for those property values to rebound so a ten year need might be required. Sales taxes dropped 30 percent, but those typically bounce back more quickly - 3-5 years. Water and sewer utilities saw decreases of 10-30%, or perhaps more in some tourist destinations. Those revenues may take 3-5 years to rebound as well. Moving money from the utility to the general fund, hampers the situation further. Analysis of the situation, while utility (government) specific, indicates that appropriate reserves to help weather the economic downturns could be years as opposed to months. The conclusion is that governments and utilities should follow the model of trying to stabilize their expenses. Collect reserves. Use them in lean times. Develop a tool to determine the appropriate amounts. Educate local decision-makers and the public. Develop a financial plan that accounts for uncertainty and extreme events that might impact their long-term stability. Take advantage of opportunities and most of all be ready for next time. In other words, plan for that rainy day. My last blog was a discussion about surpluses. The State of Florida will have a $1.3 billion surplus this year and a host of politically expedient answers for where that money goes (tax cuts, pork projects, projects to help election results), but little mention of replenishing trust funds and reserves that were emptied to balance the budget amid tax cuts from 2010 – 2012. But perhaps it is not the legislators or their constituents that we should blame for not understanding the need for reserves because the truth is that most people are not used to saving. A recent article I read noted that 72 percent of Americans live paycheck to paycheck and would have difficulty putting $2000 together if needed. $2000 is not a lot of money these days – it won’t buy you a transmission for example or a new engine for your car. It won’t cover first, last and a deposit on a rental. And it won’t cover the down payment on a house or most cars. There are people who do not receive enough income to achieve some degree of savings, but not 72% of us. We have come to perceive that having little savings is normal, but it wasn’t always this way and it is not this way everywhere in the world. Back in the day, American saved more than they do now. The reason is not that they had more money (they didn’t) or that they had less to spend money on (as things cost more proportionately). But it was that “rainy day” they all knew would come and when they would need money. They had been through depressions, recession and losses of industries (remember those Concord coachmakers did not get a federal bailout in trying to compete with Henry Ford). They knew that there would be times when they needed to rely on themselves to survive and savings was the key. There are two major differences from the past. The most important is the fact is that credit was a lot harder to come by back in the day, so you needed cash for those big purchases. That has changed dramatically in 50 years. Today we get advertisements for credit cards – in the mail, instant credit at stores, easy credit for cars, and in the early 2000s, no-money-down-no-income-verification loans on real estate. The need to save evaporated. The access to easy credit has eliminated much of the need to save for those big expenses. We can borrow to acquire them. If we have a job problem, we borrow against the house or life insurance policy. These are good backstops that help us maintain our way of life. Given this backdrop it is no surprise the attitude of decision-makers in government toward revenues and expenses. Re-education of the public is needed as opposed to rhetoric. We need to move the public discussion away from the concept of a balanced budget being expenses equal revenues to the correct concept of revenues + reserve expenses = expenses plus savings. At times you use reserves (and savings =0) while other times reserve expenses are 0, while savings are positive. When big expenses come, borrow, but recurring expenses should not be funded through borrowing (credit). We should seek to avoid is the desire to cut taxes (akin to cutting our salaries) to bring the budget back into balance that if we run a surplus, or spend it on “stuff.” Such a system leaves room for those lean times when revenues may fluctuate but expenses do not (or increase). It was not so long ago that we were talking about local and state governments suffering major shortfalls in their revenues as a result of the downturn in the economy. Cuts were being made to police, fire, education and parks. Politicians were fussing over the need to cut taxes and cut government expenditures in the process. Employees lost jobs and benefits were cut. In a prior blog we discussed the fact that economic upticks and downturns were cyclical, and unlike people, there is a tendency for local and state government policy makers to “hang with the curve” so to speak and have government expenses track the economy as opposed to try to stabilize spending by taking advantage of the ups to create reserves in order to take advantage of the downs. They ignore the old adage that their grandparents told them – save for a rainy day. And we don’t recognize those rainy days approaching! It is not a lot different unfortunately than many citizens who spend when they have money, and are short when they don’t. We are not a country of savers and it hurts us often. There is however a major benefit for government to have reserves. When government has reserves, it can take advantage of lower competition to construct or invest in infrastructure in lean times. There are many examples of governments getting construction done at discounted rates based on timing their projects to economic downturns. A side benefit is that those governments are spending money at the time when they need to keep people employed. FDR did this during the Great Depression. Obama attempted to copy him in 2009 with the AARA monies. In both cases they may not have invested enough, but both were faced with deficits on the federal level and a Congress that was reluctant to spend. The economy has rebounded and state and local governments are starting to run surpluses. The South Florida Sun-Sentinel recently reported that the big “challenge” for the Florida Legislature and many other state and local governments, is they are running surpluses. Recall the last time the federal government ran a surplus, we got tax cuts that immediately put the feds back in the red because they had not built up any reserves, and won’t even with a balanced budget anytime soon. Well Florida has $1.3 billion extra on hand and guess what we hear in this election year – tax cuts, more money for special projects, extended sales tax exemption dates, etc. Those running for office are thrilled with the surplus because it helps their platform but we hear nothing about restocking the trust funds that were raided during the 2009, 2010 and to some extent the 2011 budgets! Expect this to be the norm, and the rhetoric should be troubling to fiscally responsible people. If we have surpluses, times must be better. In good times we should be encouraging decision-makers to sock money away in reserves, savings and other solid investments, and at the same time restocking those accounts drained to pay the bills during the down time of the Great Recession. In Florida, our highway trust fund, environmental trust funds and education funds were drained. They have not been restocked. In fact the cuts to most of those programs has not been restored either. The next economic downturn will come – will we be prepared to weather storm by spending our savings as opposed to cutting services which magnifies the impact of residents? As times get better, utilities owned by local governments should pay particular attention to General Fund revenues. Many of those General Funds increased contributions from the water and sewer funds to make up the difference in losses of property and sales tax dollars. That prevented utilities from making investments, or forced them to borrow money to cover investments that might otherwise have been paid for in cash. Time for the General Fund to pay the utility back! Time to restock the reserves and time to spend money to catch-up with the deferred maintenance and capital. Of course the costs are not what they were 3 or 4 years ago, and neither are the interest rates, so we all pay more for the same projects because we could not spend the reserves in the down period. Utilities should always have significant reserves. Nothing we do is inexpensive, so having reserves makes it possible to fix things that inevitably go wrong. Reserves are a part of a well operated, fiscally sound utility. Taking money from the utility during down times hurts both the utility and the local government. Total reserves diminish of the entity, making it less possible to deal with emergencies, cover the loss of revenues, or take advantage of lower costs for construction projects. Meanwhile, creating reserves and a pay-as-you-go system for ongoing replacement of pipes and pumps is good business. It insures that ongoing money is spent to prevent deterioration of the utility system. The reserves allow for accelerated expenditures when times are tough, prices are down and people need work. When utilities spend money, it translates to local jobs. But the only way to do this is make convincing argument of the benefits of reserves and spending. Do something nice for that special person in your life. Make their life a little more enjoyable! Regardless of the causes, southeast Florida, with a population of 5.6 million (one-third of the State’s population), is among the most vulnerable areas in the world for climate change due its coastal proximity and low elevation (OECD, 2008; Murley et al. 2008), so assessing sea level rise (SLR) scenarios is needed to accurately project vulnerable infrastructure (Heimlich and Bloetscher, 2011). Sea level has been rising for over 100 years in Florida (Bloetscher, 2010, 2011; IPCC, 2007). Various studies (Bindoff et al., 2007; Domingues et al., 2008; Edwards, 2007; Gregory, 2008; Vermeer and Rahmstorf, 2009; Jevrejeva, Moore and Grinsted, 2010; Heimlich, et al. 2009) indicate large uncertainty in projections of sea level rise by 2100. Gregory et al. (2012) note the last two decades, the global rate of SLR has been larger than the 20th-century time-mean, and Church et al. (2011) suggested further that the cause was increased rates of thermal expansion, glacier mass loss, and ice discharge from both ice-sheets. Gregory et al. (2012) suggested that there may also be increasing contributions to global SLR from the effects of groundwater depletion, reservoir impoundment and loss of storage capacity in surface waters due to siltation. Why is this relevant? The City of Fort Lauderdale reported last week that $1 billion will need to be spent to deal with the effect of sea level rise in Fort Lauderdale alone. Fort Lauderdale is a coastal city with canals and ocean property, but it is not so different from much of Miami-Dade County, Hollywood, Hallandale Beach, Dania Beach and host of other coastal cities in southeast Florida. Their costs may be a harbinger of costs to these other communities. Doing a “back of the napkin” projection of Fort Lauderdale’s cost for 200,000 people to the additional million people in similar proximity to Fort Lauderdale means that $5 billion could easily be spent over the next 100 years for costal impoundments like flap gates, pumping stations, recharge wells, storm water preserves, exfiltration trenches and as discussed in this blog before, infiltration galleries. Keep in mind that would be the coastal number and we often ignore ancillary issues. At the same time, an addition $5 to 10 billion may be needed for inland flooding problems due to the rise of groundwater as a result of SLR. The question raised in conjunction with the announcement was “is it worth it?” I suggest the answer is yes, and not just because local politicians may be willing to spend money to protect their constituents. The reality is that $178 billion of the $750 billion economy of Florida, and a quarter of its population, is in the southeast. With nearly $4 trillion property values, raising a few billion for coastal improvements over 100 years is not an insurmountable task. It is billions in local engineering and construction jobs, while only impacting taxpayers to the tune of less than 1/10 of a mill per year on property taxes. This is still not an insurmountable problem. A number of years ago I had the pleasure of speaking with archeaologist Bryan Fagan for an hour or so before a presentation he gave at a conference. Dr. Fagan is a modern-day Indiana Jones, who has been all over the world studying ancient ruins. Dr. Fagan expressed his career as “50 years of studying drainage ditches,” but with studying drainage ditches he could provide you with the rise and fall of civilizations through history. His book Elixir outlines a number of these civilizations: Egyptian, Babylonia, Southeast Asia, and even the American West. His findings were that the civilization expended as far as infrastructure could be constructed to allow water to flow to where it was needed, whether that was Alexandria or Ur. Later civilizations expanded and developed as technology allowed water to flow further. Rome demonstrated that water could be moved with more than ditches, which would have been a severe limitation for Rome and other civilizations based in dry areas with topography. The Romans constructed extensive tunnels and aqueducts to supply Rome with water from mountains to the east and north. A recent article noted that we probably know about 20% of the Roman tunnel system as we keep discovering more of it each year – tunnels lost in the Dark Ages after the fall of Rome. Dr. Fagan notes that it was access to water that allowed human civilizations to develop and evolve. It is why a number of engineering organizations like Water for People and Engineers Without Borders focus their efforts on providing access to clean water to people in Third World countries. It is their only way to get to the modern world. All other infrastructure: roads, major buildings, etc., result from the access to clean water that allows people to be healthy and productive. So if civilization rises and falls with access to water, why is it so hard to get public officials to fund water supply and rehabilitation projects? We talk of an infrastructure crisis in the United States because our average water and sewer infrastructure systems are working on 50 years old and deterioration is evident. We have many mid-western communities with water, but no customers to pay for deteriorating infrastructure (Detroit), and southeastern utilities that have lost factories that supported the bulk of their utility, and insufficient growth in the customer base to deal with operations and maintenance. As a result, outages and breaks occur more frequently, costing more money to repair, but under the auspices of maintaining rates, the revenues do not increase to support the needed repairs. At least the southeast has surface supplies, albeit perhaps limited, which constrains growth (Atlanta), but our fastest growth often occurs in areas we know have limited precipitation, like a lot of the American West. Yet somehow we expect groundwater sources that do not recharge locally, to sustain the community indefinitely without disruption – ignoring the fact that history tells us communities cease to function when water supplies are exhausted. USGS identified many areas that have long-term permanent declines in aquifers as a result of pumpage for agricultural and community uses. No one raises the question about the aquifer levels – permits get issued, but little data is gathered and very limited plans are available in most places to deal with the declines. And no one raises a question about aquifer levels because stopping growth to deal with water supplies is not in conformance with the desire to grow, which is required to support additional services demanded by the community. No one questions how to secure the water either, much of which has been “created” by federal tax dollars spend over 50 years ago during the era of great dam building (1920-1960). However, as these systems and populations age, the concern about costs will continue to engender discussion. And hand wringing. Water costs money. Water creates civilization and sustains it. When we take it for granted, it becomes all too easy to fall behind the proverbial “eight-ball,” and the system crashes. It is a testament to the utility personnel – the managers, engineers and operators – that these systems continue to operate as they do. But bailing wire and duct tape only go so far. We need to develop a frank discussion about the need to infuse funds – local, federal, state and private – into addressing our infrastructure needs. The dialog needs to commence sooner, as opposed to after failure. It’s groundhog day and Super Bowl Sunday! The groundhog saw his shadow indicating 6 more weeks of winter, but you wouldn’t know it at the Super Bowl. The bright lights are on in New Jersey with over 80,000 fans braving the cool, but no the harsh cold weather of last weekend. Just like the groundhog this morning, millions will be watching. The Super Bowl is biggest one day sporting event in the world with over 100 million viewers watching it live in the US, and over a billion around the world. And we all enjoy the commercials too, but it speaks to our priorities when a 30 second commercial will cost $4 million. A lot of utilities could do a lot with $4 million. Just saying….